There are so many great photo opportunities around Epcot's World Showcase. 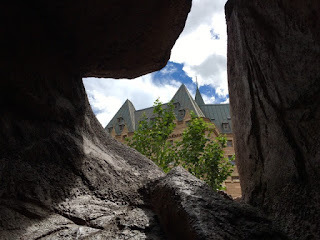 Last week, while waiting for my tour guests outside of the O'Canada film, I noticed this interesting angle. Looking through these rocks, you can see this pavilion's icon, the Hotel du Canada.